These spareribs are steamed Chinese-style with salted (fermented) black beans, tangerine peel, garlic, ginger, and soy sauce. Spareribs are pork and cut from the bottom section of the ribs and breastbone of the pig, just above the belly. 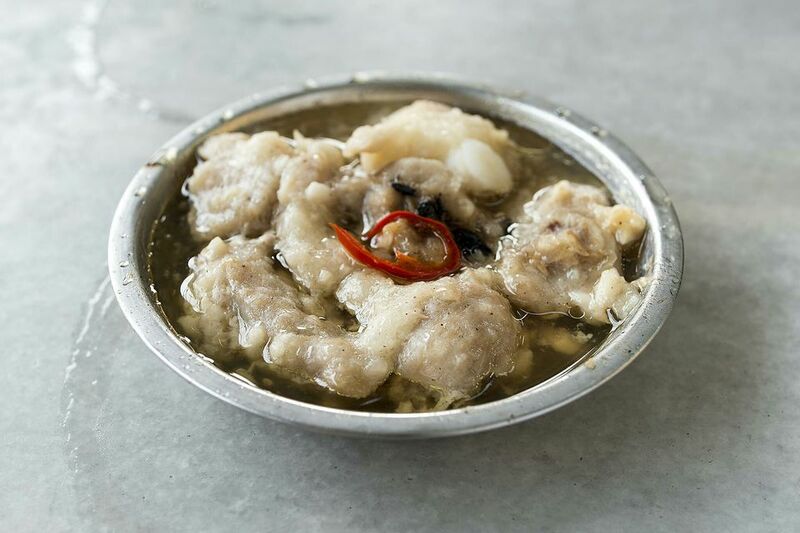 You will often find these steamed spareribs as part of a Chinese dim sum. Rhonda Parkinson, Chinese Food Expert, says dim sum literally means "to touch your heart," and the spread consists of a variety of dumplings, steamed dishes, and other goodies. Cut 1 pound pork spareribs crosswise between the bones into 1-inch pieces. Trim off excess fat. Put ribs into a large mixing bowl. Soak the optional 1-inch piece of dried tangerine peel in hot water for 10 minutes. Drain, finely mince and set aside. Rinse the 2 tablespoons salted (fermented) black beans with warm water; drain. Gently mash the beans, 1 teaspoon minced fresh ginger, 1 tablespoon minced garlic, 1/4 teaspoon salt, and 1 teaspoon sugar into a paste. Stir in the tangerine peel, 1 tablespoon each dark soy sauce and light soy sauce or 2 tablespoons light soy sauces, 1 tablespoon Chinese rice wine, 1 teaspoon toasted sesame oil, and 1 red or green sliced chile pepper, if using. Pour over the spareribs and mix well. Transfer to a shallow, 9-inch, heat-proof plate (a glass pie plate is perfect) and refrigerate for at least 30 minutes. Let the plate of ribs come to room temperature. Place in the steamer, cover and steam over boiling water (medium-high heat) for 45 minutes. Check water level frequently and replenish with boiling water when needed. Recipe Source: Joyce Jue. Reprinted with permission. Rhonda Parkinson, About.com's Chinese Food Expert, says dim sum is a Cantonese custom, linked to the Chinese tradition of yum cha or drinking tea. Teahouses sprung up to accommodate weary travelers journeying along the famous Silk Road. Rural farmers, exhausted after long hours working in the fields, would also head to the local teahouse for an afternoon of tea and relaxing conversation. Small bites food were eventually served with the tea and dim sum was born.